We hired Pepe's company for our Annual Holiday Gift Giveaway. We provided gifts to over 300 children and held an awesome party for them. The children absolutely loved getting their faces painted and creating awesome balloon figures. The staff was very professional and punctual. Cassie and Kat were perfect and did an excellent job. They were so talented and creative to provide any suggestions and designs. They were very clean and fast. I will definitely use them again. Great experience. Jose (Pepe) was wonderful! He was able to have a great face painter for our Muscle Walk event. We have this event annually to help find treatments and cures for local families who have neuromuscular disease. Many of our families are in braces, walkers, wheelchairs, etc. She was so nice, professional and on time. All the kids and even a few adults enjoyed the creative designs! Thank you so much for being there to bring smiles to our families faces! We are so grateful! Thank you so much for including us in your event. We really appreciate your feedback and look forward to working with you again in the future. Remember Balloon Art Design can provide professional entertainers, balloon decorations, balloon artists, face painting, glitter tattoos and Game masters. Everything you need for your special event. A Fun and Trustworthy Company to Work With! Balloon Art Design is an amazing business to work with. Pepe is a devoted artist that loves to entertain and present an impeccable workmanship. Someone you can trust and rely on. His art and designs are creative, unique and amusing. I recommend this company 100% to everyone that desires a memorable and artistic event! Pepe and his team are professional in their work. They performed a formidable quality decoration using balloons and lots of art. The BEST BALLOON ART DESIGNER!!! 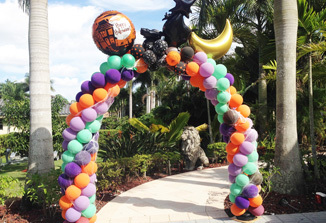 PEPE, will WOW your guests with his unique and innovative balloon creations. He has a great personality and works very good with kids. I will recommend him for your next event. I hired him in the past for a weeding reception and many different kids parties, and he always amazes me with his expertise and creativity. Our face painters will transform your guests into lions and tigers, bunnies, super heroes, fairies and princesses, monsters, pirates or just about anything else you can dream up! They will make your event a truly fun, imaginative and memorable one. We can transform your next corporate event into a day that your kids will be talking about for weeks. We specialize in corporate parties in Palm Beach with great corporate kids entertainment for a company picnic, grand opening, or holiday party. Find decorations for every occasion with event decorations from Stumps. From background materials to decorative props, you’ll find a wide selection of party dcor that fits perfectly with any special occasion. We offer quality entertainment for both large corporate or public events as well as small private celebrations. We offer more then the "normal" Balloon Animal. Ours are amazingly detailed, multiple balloon creations!. 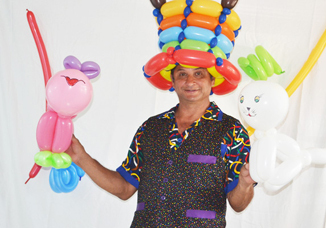 Jose (Pepe) Gonzales will enhance your birthday party with his ability to twist balloons into popular shapes and figures much to the delight of children and adults alike! Ask about our special “themed” designs. He is a self trained and accomplished balloon design artist who is driven by his passion to create and delight his clients and their guests. PEPE has gained much popularity and respect for his unique talent in his field and also from his customers. He began his career 3 years ago in restaurants twisting and shaping balloons for their customers and due to popular demand, he decided to take his “gift” to a higher level of art and that is how Balloon Art Design was brought forth. Jose (Pepe) covers many facets of balloon designs and services such as Corporate Events, Parties for any occasion and popular local events. Pepe creates many of his own original designs as well as every imaginable request including: figures, sculptures, arches, columns, center pieces and designs small or large.